Larimer Square is the site of Denver’s first settlement in 1858, a few months after the first significant gold discovery in the Rocky Mountains kicked off the Colorado Gold Rush. It’s also the site for the first two dozen buildings constructed in the fledgling city. Denver was founded by land speculator William Larimer and his partners, who staked a square-mile claim on a hill overlooking the confluence of the South Platte River and Cherry Creek and began selling parcels of land to miners and merchants. Larimer named the settlement “Denver City” to curry political favor with James W. Denver, the governor of the Kansas Territory. What Larimer didn’t know was that Denver had already resigned. Larimer also had established Denver City on top of a claim filed earlier for St. Charles Town, which was located close to where the Granite Building now stands at the corner of 15th and Larimer streets. Larimer and his partners had to convince a St. Charles Town Co. representative to surrender his claim to Denver City’s. The persuasion: a barrel of whiskey, and a threat of hanging. Denver City’s main street was named after Larimer, and Larimer and his son constructed a 16-foot-by-20-foot cabin, with doors made of coffin lids on the site where the Granite Building later went up. Larimer also faced a challenge from the settlement of Auraria that was being developed across Cherry Creek, near where Speer Boulevard crosses Larimer Street. Auraria was founded by William Greeneberry “Green” Russell, a Georgian who had made the gold discovery that had kicked off the gold rush. The fledgling Denver City quickly became a frontier boomtown, filled with shacks, shanties, and log cabins, plus teepees that were the seasonal homes for the Arapaho tribe led by Chief Little Raven, who had welcomed the whites to share his camp. The population hit 4,749 in 1860, held at 4,759 in 1870, and reached 35,629 in 1880. Auraria also grew, and the two towns became rivals. Greeley wrote that he thought Auraria had the better chance of winning out. In 1860, however, civic boosters convinced the two settlements to merge under the name “Denver,” and the consolidation was marked by a torch-lit ceremony on the Larimer Street Bridge over Cherry Creek. The Larimer cabin was torn down in 1861 and replaced by a one-story false-front store that eventually gave way to the Granite Building. Other wood buildings sprouted up, but many of them were destroyed by fires in 1863. Larimer Square recovered with brick and stone buildings and was Denver’s hub by 1870, with the city’s first bank, dry goods store, photo studio, bookstore, post office, theater, and streetcar line. The first municipal building went up at 14th and Larimer streets. Across the street, in the Miller Building, 1401 Larimer St., was Gahan’s Saloon, whose clientele included politicians, police officers, and journalists. With prohibition, it became Gahan’s Soft Drink Parlor, though it reportedly had a popular speakeasy in the basement. The municipal building was torn down in the 1940s. Development was spurred by the arrival in 1970 of a Union Pacific Railroad line from Cheyenne to Denver, which was financed by federal grants and local bonds. The line connected with the Transcontinental Railroad in Cheyenne. 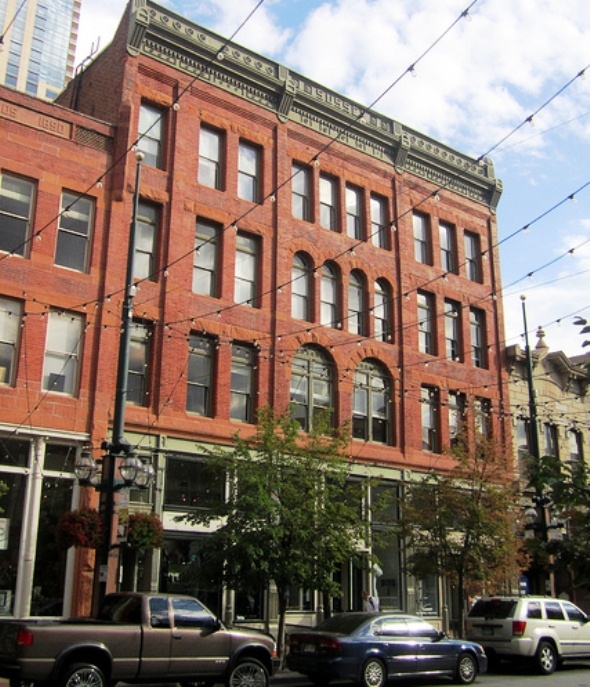 In 1873, the Kettle Building, 1422 Larimer St., also known as “Kettle Arcade” because of an iron sign at street level, was built by George E. Kettle, a cattleman, butcher, and real estate investor. The arcade’s ceiling features paintings with key figures from Denver’s early history, including Larimer himself, Chief Little Raven, sharpshooter Annie Oakley, con man Soapy Smith, and Denver Mayor Robert Speer. In 1882, George and William Clayton erected the four-story Clayton Building to house the MacNamara Dry Goods store, predecessor of the Denver Dry Goods Co. The building was converted into the Granite Hotel in the early 1900s, and the structure was renamed the Granite Building. Its restoration in the 1960s uncovered large plate glass and stained glass windows, cast iron pillars stamped “Colorado Iron Works,” and a grand staircase. Larimer Square declined after the silver crash of 1893, which resulted in the closure of silver mines in the mountains that had been supplied by Denver. The street became overrun with unemployed miners and railroad workers attracted by 55 saloons and a third of the city’s gambling houses, which were supported by corrupt city officials. By the 1930s, urban decay had left a skid row of pawnshops, bars and flophouses, and Denver voters in 1967 approved plans by the Denver Urban Renewal Authority to demolish and rebuild 30 blocks downtown, including Larimer Square. Denver preservationist Dana Crawford rescued the buildings and formed Larimer Square Associates in 1963 to revitalize all 16 of the commercial buildings on the block. By 1969, the buildings were the home of shops, restaurants and offices, while nearby blocks had been cleared, many serving as parking lots while waiting for redevelopment. Larimer Square became Denver’s first historic district in 1971, and the Denver Urban Renewal Authority’s efforts led to the construction of new buildings nearby that revitalized Denver’s core. The redevelopment efforts spilled into LoDo, or lower downtown, refurbishing brick buildings there that had been in a state of decline. The district now includes more than 100 tenants, more than 40 of them retailers or restaurants.